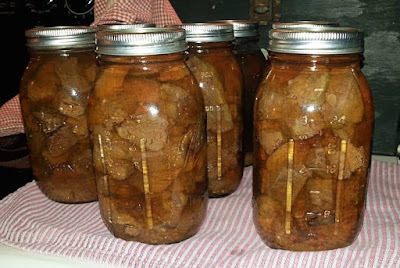 Rules for Canning Meats - Canning Homemade! Canning meats is a great way to put up food when you need to make something quickly. Instead of waiting a few hours for that stew meat to get tender you will can the meat to fork tender and save a lot of time. Canning meat is simple as long as you follow a few simple rules. These rules for this post pertain to Bear, Beef, Lamb, Pork, Veal, and Venison. 1. Make sure that you trim as much fat from the raw meat as possible. The key to a longer shelf life is to eliminate the excess fat that is easy to cut away. Using leaner cuts of meat is a way of getting away from the fat. 2. Whether you raw or hot pack the meat make sure that when you wipe the rims of the jars use white vinegar on your paper towel to not only clean the rim but to possibly eliminate any fat that may have splattered so that you get a good seal. 3. The processing time for ground or chopped meat (sausage is included) is the same for strips, cubes, or chunks of meat. 4. Chopped meat must be hot packed. The meat must be cooked and then the fat drained. Cased sausage cut to 3 - 4" links. 5. Strips, Cubes, or Chunks of meat can be raw or hot packed. 6. Liquid must be added to hot packed meats - you can use meat broth, tomato juice or water. For raw packed meats you will not add liquid. 7. Salt added to each jar, 1 teaspoon per quart, is optional and not required for preservation for either raw or hot pack. three or four parts venison before grinding. Use freshly made sausage, seasoned with salt and cayenne pepper (sage may cause a bitter off-flavor). Shape chopped meat into patties or balls or cut cased sausage into 3- to 4-inch links. Meatballs should be formed into 1 to 2 inch balls. Cook until lightly browned. Ground meat may be sauteed without shaping. Remove excess fat. Fill hot jars with pieces. Add boiling meat broth, tomato juice, or water, leaving 1-inch headspace. Remove air bubbles and adjust headspace if needed. Add 1 teaspoon of salt per quart to the jars, if desired. Wipe rims of jars with a dampened(vinegar) clean paper towel. Adjust lids and process. Procedure: Choose quality chilled meat. Remove excess fat. Soak strong-flavored wild meats for 1 hour in brine water containing 1 tablespoon of salt per quart. Rinse. Remove large bones. 1-inch headspace. Remove air bubbles and adjust headspace if needed. Raw pack—Add 1 teaspoon of salt per quart to the jar, if desired. Fill hot jars with raw meat pieces, leaving 1-inch headspace. Do not add liquid. Wipe rims of jars with a dampened(vinegar) clean paper towel. Adjust lids and process.